Lemnoideae contains five genera about 35 species, which are distributed worldwide (Landolt 1998). 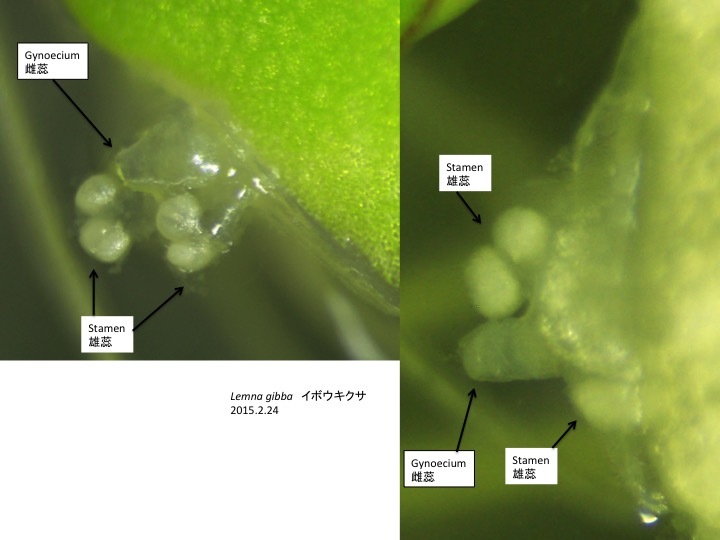 Evolutionary rate is accelerated in Lemnoideae (Nauheimer et al. 2012). Relationship between the accelerated evolutionary rate and conspicuous morphological differences from sister taxa is unknown. Landolt, E. 1998. Lemanceae. In K. Kubitzki ed. The Families and Genera of Vascular Plants. Pp. 264-270. Nauheimer, L., Metzler, D., Renner, S.S. 2012. Global history of the ancient monocot family Araceae inferred with models accounting for past continental positions and previous ranges based on fossils. New Phytol. 195: 938-950. 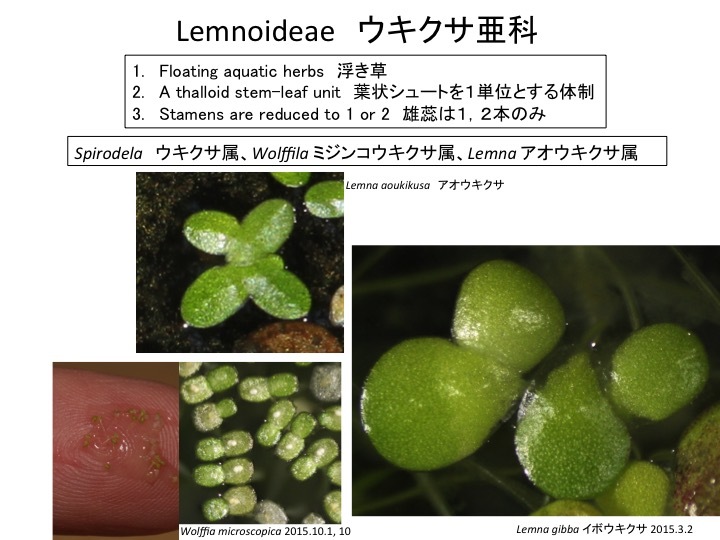 Based on the comparison of development of Spirodela, Lemna, and Wolffia, Lemon and Posluszny (2000) agreed to previous ideas that the frond is a developmental hybrid of leaf and stem origin. When the more detailed development of Wolffia microscopica (Sree et al. 2000) is incorporeted, it appears for me that the early development of the frond is shoot-like with producing detached meristems as daughter fronds and that the later development is leaf-like. 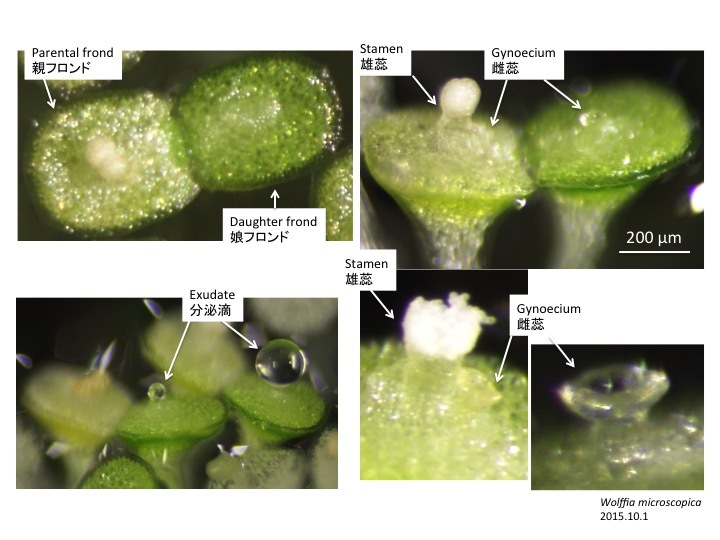 This developmental process looks similar to that of the Hydrobryum japonicum and Cladopus doianus in the Posdostemaceae, in which the shoot meristem genes, STM and WUS are expressed at the early primordium and then are substituted by the leaf gene ARP in the later development (Katayama et al. 2010). Analyses of these genes as well as auxin which is involved in the differentiation of shoot meristem and leaves will give insight in the homology of the frond in Lemnoideae plants. 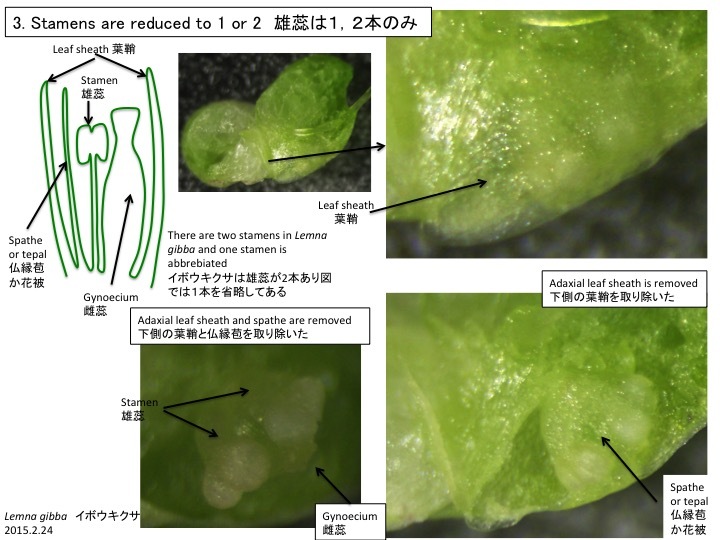 Katayama, N., Koi, S. and Kato, M. (2010) Expression of SHOOT MERISTEMLESS, WUSCHEL, and ASYMMETRIC LEAVES1 homologs in the shoots of Podostemaceae: Implications for the evolution of novel shoot organogenesis. Plant Cell 22: 2131-2140. Lemon, G.D. and Posluszny, U. 2000. 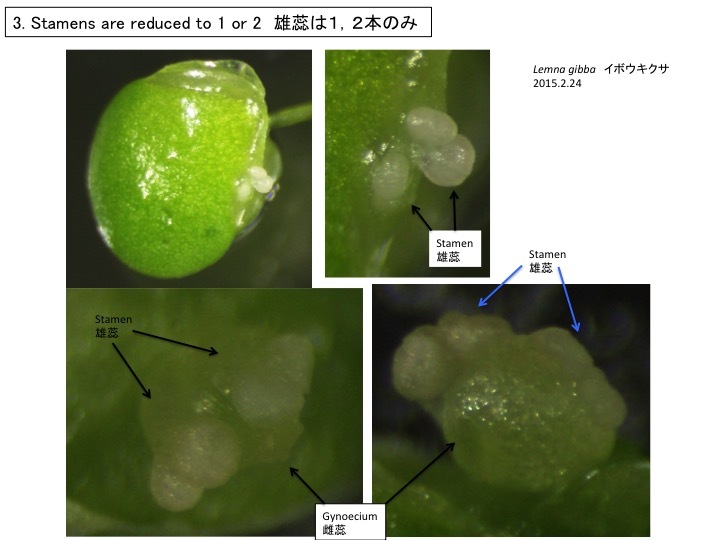 Comparative Shoot Development and Evolution in the Lemnaceae. Int. J. Plant Sci. 161: 733-748. 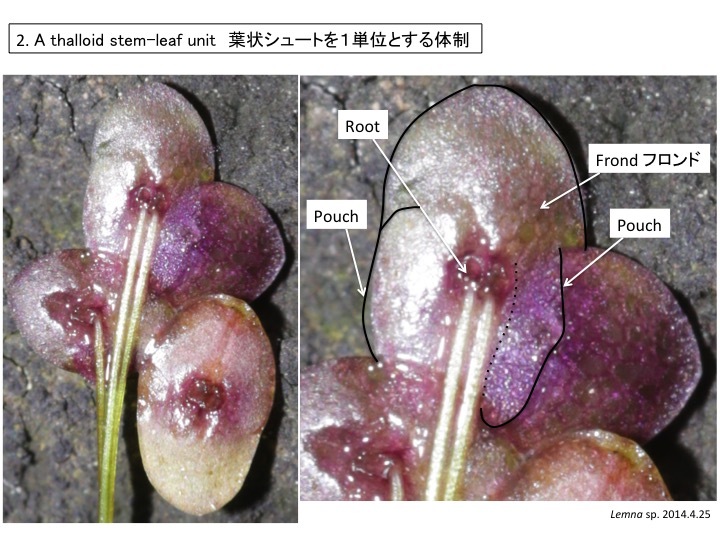 The reproductive organs of Lemnoideae have been interpreted as an inflorescence with postulating a close relationship to Pistia. 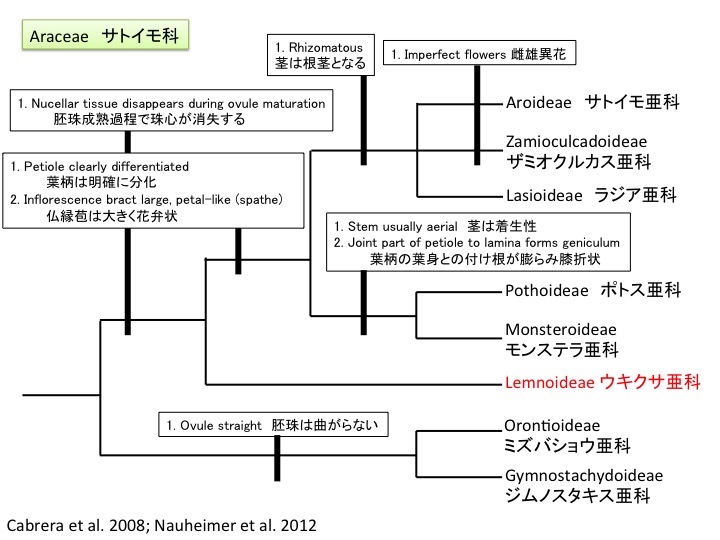 However, molecular phylogeny revealed that Pistia and Lemnoideae are not closely related. Now, one reproductive unit including one or two stamens and one pistil is interpreted as a flower. A flower without petals and petals is subtended by a membranous scale like leaf. It is unknown whether this scale is a tepal or a spathe. Here it is tentatively indicated as a spathe. Lemna gibba forms two stamens and one gynoecium. Wolffia forms a single stamen and a gynoecium. The lengths of a stamen and a gynoecium are 200 µm and 100 µm, respectively.A gynoecium comes out and then a stamen does. At the base of the stamen, the gynoecium still remains. Exudate is formed at the tip of a funnel-like stigma for pollination. In comparison to other Wolffia species, W. microscopica frequently blooms and is useful for experiments in flowering. Sree, K.S., Maheshwari, S.C., Boka, K., Khurana, J.P., Keresztes, A., and Appenroth, K.-J. 2014. The duckweed Wolffia microscopica: A unique aquatic monocot. Flora 210: 31-39. 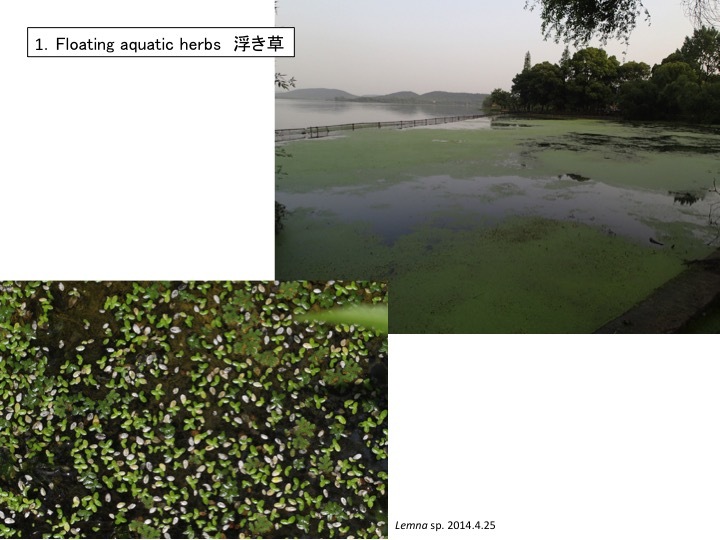 I appreciate Dr. Tokitaka Oyama for providing materials of Lemna gibba and Wolffia microscopica and kind instructions for the cultivation and flowering.